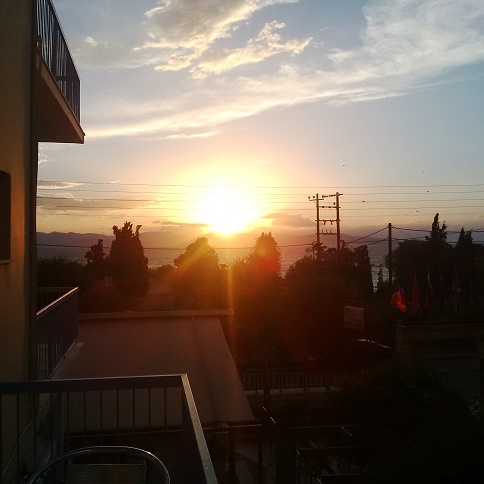 More stories about our trip to Greece | Turning my world upside down! Only 2 days earlier, we had still been on the island of Aegina, just a ferry ride away from Piraeus on the mainland. Our second day on the island included a car rental so we could drive around the island and see a few of its beaches. We also stopped at the Temple of Afea, a lesser known goddess only worshiped on this island. The temple, unlike the one to Apollo near our hotel, is very well preserved/reconstructed. As usual, the day was hot so that walking through ruins was not something we wanted to do for long periods. We drove to the southern tip of the island, passing pistachio orchards (or are they groves?) until we arrived at a secluded, sheltered cove where we found a beach bar. Leon and I relaxed and swam in the warm sea for our last time during this holiday. As we drove back north towards the town of Aegina, the wind was very strong as it had been the previous day. We had a short swim in the pool and tried not to blow away as we sat on our balcony for a pre-dinner drink. Dinner was a short walk back down the hill to the marina area we so enjoyed. The boats seemed safe enough on this night and no incidences were observed. Thank you for that comment. This was not mentioned in any of the literature or on the plaques at the temple. I know. Probably Athens wants you to forget – it certainly did around 480 BC. But that site is much older than the existing temple. And Pausanias I think suggests that she is really Britomartis from Bronze Age Crete. She was a Minoan nymph who vanished into teh sea and was trawled up by Aegina’s fishermen. I was very happy with my little Blackberry phone used as a camera. Worth keeping it well after I move to a new phone. Fantastic photos of the temple against the blue sky.